Discussion in 'Downhill & Freeride' started by S.K.C., Sep 13, 2005. - How much does this system weigh in comparison to an MRP System 3 w/ an aluminum bash ring? - What kind of material are you using for the bash guard? - How much friction is there in this system compared to a dual urethane roller setup? isn't this some "race" only version that's meant to be really light and not provide much protection. I think this was talked about a couple of weeks ago. Looks cool, but I definantly need a bashguard! Glad you like the look of it, we have been testing it for 7 months, it won tthe European DH championships, A World Cup, and the World Championships, so its been tested hard in that time. Quite a few pro 4X racers are on them now also. First off, this new guide is called the LG1. It has been secret #1 at e.thirteen for almost a year now. We have put a ton of time and resources into its development, and through what we learned in the process it helped to shape the 06 SRS, which shares a lot of new features with this guide. It is the product of a lot of requests from customers for a really lightweight guide that actually keeps the chain on. It is not meant to take huge impacts, but it can take as much as many other heavier guides that we have tested. It is also 100% interchangeable with the SRS. The LG1 is the subject of several new patent applications. 1) Light as all heck. The thing weighs 195 grams and will fit a 34T - 44T ring. There will be a formula version next year some time that we have been testing that weighs 135 grams. The sliders use a new composite construction. 2) There is no bashguard, but we have been testing a few new things with our pro riders. There will be an additional bashguard kit at some time. 3) Measurements on actual bikes show significantly less resistance with the idler setup. The 06 single ring guides use a new 1-piece idler assembly that is made from a material similar to the DRS stealth roller. It is silent and the producton test samples have proven to last for the entire race season so we are excited about it. There will be a full release at Interbike. 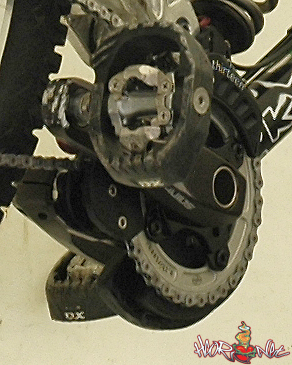 I like how the pic shows a "weight saving" guide w/o a bashguard on some of the heavier cranks out there (Saints). Oh - I know. It just made me laugh. Guide looks nice, btw. I hope the DRS isn't getting upgraded, because I just bought a new one a couple days ago. ......ummm...I think even MY bike might get lighter with one of those on it...Dave, you going to Diablo next week? On a scale of 1-10, with the SRS being a 10, give us your honest opinion on how durable and protective this new LG1 will be. I'm sure they'll sell like hot cakes either way. Nice, I want to build a DS bike so I can put one on. I saw it on Heiki's bike at mount snow looks really good. May work well and all, but doesn't look nearly as cool as the current SRS IMO. Batman wants his chainguide back. first thing i thought of chico. im not to sure about the whole no bashguard thing. well you could always by an aftermarket bashguard and put it on. would work just as well. ohh well im a fan of the srs and dont think im gonna change. dw you guys have made some sweet products and this is deffinatly one of them. Crap. I've killed us all. not that its meant to be run as such, but there doesn't appear to be any room to run a normal bashguard with this system. How would it rotate with the upper and lower guide areas so close to the chainring? The new SRS must be much different than this design if it uses a bashguard anywhere near the thickness of what e13 uses now. Why is everyone so confused. This guide is meant to be run WITHOUT a bashgaurd. As in, if you need a bashgaurd, buy a SRS. They work great but the bashgaurd is an integral part of making the guide work. I will be buying one of the new guides. I rarely hit my gaurd and the little tab on the boomerang should provide enough protection for me. Reminds me of my old MR.DIRT. for those who are thinking about this and the MRP system 3 I saw 3 4x racers using the full carbon mrp system 3 loose there chain at fort bill. Reminds me of the old Yeti chainguide. I never lost a chain with that thing.